Twenty minutes later, we’re sitting at a picnic table at Hog Island Oyster Co., shucking and slurping cold, firm, plump Pacifics harvested a few hundred feet away. You can find good local food in any number of beautiful places, but in Tomales Bay, on California’s North Coast, there’s a special kind of seamlessness between the act of eating and just being in nature. 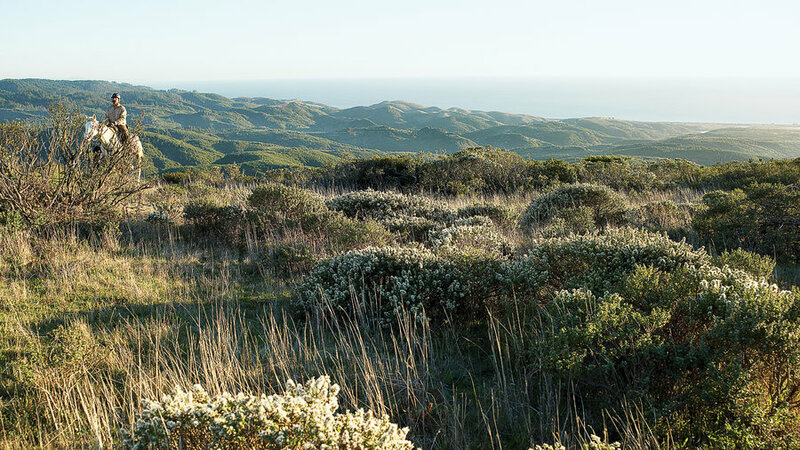 The loveliness of this landscape, which flanks the Point Reyes National Seashore, is in fact shaped largely by food and the raising of it. The grassy hills on the bay’s eastern shore ― as tawny and shiny now, in late summer, as a Siamese cat’s fur ― are pastures for dairy cows and beef cattle. Fruit and vegetable farmers cultivate this land too, and grapevines stipple the hills with bright patches of green. In the bay, halibut, sturgeon, perch, and herring thrive in water shared by the thousands of oysters growing there, busily filtering plankton. The briny sweetness you taste in the water when you swim in the bay is in the oysters too. We’re here to savor all this local bounty as well as the golden beauty of September on the coast. And we’re here to check out Nick’s Cove & Cottages, the 1930s fish house and cabins on stilts over the water that have just been reinvented and reopened by legendary San Francisco restaurateur and designer Pat Kuleto. We’ll eat, we’ll sleep, and we’ll revel in good food and fall beauty. Tender, meaty burgers of fresh-ground local sirloin are an auspicious first meal at Nick’s Cove, where the menu could almost be a guide to local producers: Cowgirl Creamery cheese; tender, perfect lettuce from Star Route Farms; Brickmaiden Breads’ and Della Fattoria’s fragrant, yeasty loaves; and butter that hints at the coastal grasses and herbs the cows graze on at Straus Family Creamery, the first organic dairy in the West. The restaurant itself evokes the local scene so strongly that it’s hard to believe it’s just a few months old. The vintage marble oyster bar, with its coiled rope detailing, is still there, as is the original (skillfully retouched) taxidermy, including a regal moose head over the entrance. “You walk into Nick’s Cove, and it’s 50 years ago,” says Kuleto, who’s here in between meetings with staff. “Spiffed-up, but otherwise going back in time.” Kuleto is cooking up all sorts of plans: delivery of fresh fish right to the dock outside; an organic farm across the road just for the restaurant; its own oyster beds. We’re eager to check out the source of all these oysters ourselves, so early the next morning we paddle kayaks out into the bay with Scott Terriberry from Point Reyes Outdoors, a veteran kayaker and seasoned naturalist. He has the vision of an eagle, pointing out snowy egrets on the bank and, barely visible above the surface of the water, the sweet whiskered face of a harbor seal, blinking wetly at us. “Look!” he says as we’re gliding over a shallow, sandy patch. Not 2 feet below, a baby leopard shark swishes by. On the other side, we see bright orange sea stars on the rocky banks. Finally we head back past Hog Island and its smaller sidekick, Piglet Island ― and, of course, oysters: thick plastic-mesh bags filled with them and laid flat on racks in shallow, nutrient-rich water. Once you start thinking about oysters, it’s hard to stop. And if you’re slightly cold and wet, nothing beats a barbecued oyster. So right after we’re out of the kayaks, we’re at the Marshall Store, a breezy, sunny box of a building on stilts next to a boatyard, chowing down on the best in the bay ― meaty little nuggets doused with garlic-herb butter and spicy chipotle sauce. Then it’s off to the town of Point Reyes Station for the finest produce around. Held at Toby’s Feed Barn, the local farmers’ market is sponsored in part by Marin Organic, a visionary group that wants to make Marin the first completely organically farmed county in the nation. We snack on incredibly sweet, fragile strawberries and juicy dry-farmed cantaloupe, then wander inside the barn, where posters of heroic-looking farmers hang on the wall over the local jams and dairy products. We stroll two blocks to another town institution, Tomales Bay Foods, housed in a graceful old barn. Dreamed up by Sue Conley and Peggy Smith, both former Bay Area chefs, it’s a showcase for Marin County organic produce, cheeses, meats, breads, and wines. It’s also where Conley and Smith produce their Cowgirl Creamery cheeses ― seven or eight knockouts, all from Straus Family Creamery milk (you can watch them being made through a long window near the barn entrance). Red Hawk, a meltingly delicious triple cream, gets its russet-colored rind ― the color of the big birds that soar over the bay ― from microorganisms that float naturally in the air here. Firm, complex Pierce Point is rolled in herbs gathered from its namesake spot on the tip of the Point Reyes peninsula. These cheeses are about as pure an expression of place as you can find. We buy both of them at the cheese-sales counter, then check out what’s on offer at Cowgirl Cantina, the barn’s take-out counter. Chef Paul Buscemi makes picnic food, mainly from ingredients sold in the building, that’s so inventive and good I get dazed trying to choose. Luckily, Peter helps, and we get juicy sandwiches of Marin Sun Farms’ grilled lamb, feta, tomatoes, and cucumber; a buttery tart of Point Reyes Original Blue, the only blue cheese made in California; and a compote of ripe figs and strawberries, plus a moist, almondy polenta cake. We take it all a short drive north to Heart’s Desire Beach, put our toes in the sand, and eat our feast in a state of bliss.